Q: Who is eligible to register for and attend Project Cicero? Q: When can you attend Project Cicero to collect books for your classroom? Q: What types of books does Project Cicero provide? A: We collect gently used or new books from board books, early readers to High School level. We also receive brand new publisher books. The distribution site is organized by book categories: Picture books, Early reader, Chapter books, High School fiction and subject tables of History/Biography/Social Studies, Reference books, Foreign language, Arts/Poetry/Drama/Music, Sports, Reading/Writing instructions and Math/Science. Q: Is there a limit on the books a teacher can bring home? A: No limits overall: A teacher can take home as much as they can carry in their suitcase or bag. There are however some subjects where we need to limit books due to availability. 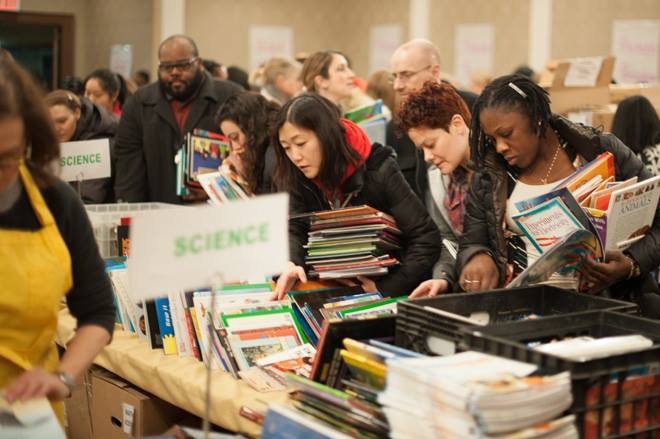 Project Cicero also offers an opportunity to take home full boxes of Chapter books (all elementary ages mixed) and/or High School books which are available all weekend. Q: Will there be fewer books available if I have a time slot on Sunday rather than Saturday? A: Every 45 minute time slot is a good time slot. We replenish our selection of books every hour throughout the weekend, as sorting is continually in progress. Q: Can I also volunteer and not just pick up books? A: Yes, we welcome teacher volunteers but please sign up via our volunteer registration site for a time slot.